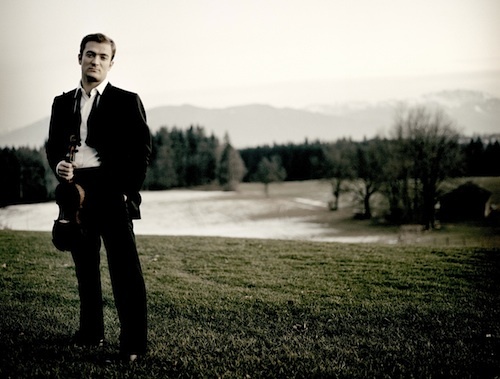 October 25, 2012, 2:15 PM · A soloist who has played with many of the world's finest orchestras, French violinist Renaud Capuçon nevertheless finds much of his artistic nourishment in chamber music. Earlier this fall, Capuçon released a recording of two major works for solo violin: the Brahms and Berg Concertos, performed with conductor Daniel Harding and the Vienna Philharmonic. Harding -- a longtime friend -- will also join Capuçon this weekend in Los Angeles, for three performances the Korngold Violin Concerto with the LA Philharmonic. It's a piece that Capuçon recorded in 2009, alongside the Beethoven Concerto. Capuçon's achievements in chamber music are equally impressive. His long list of collaborators include: Martha Argerich, Daniel Barenboim, Elena Bashkirova, Hélène Grimaud, Yefim Bronfman, Myung-Whun Chung, Stephen Kovacevich, Katia and Marielle Labèque, Mikhail Pletnev, Jean-Yves Thibaudet, Vadim Repin, Yuri Bashmet, Truls Mork, Paul Meyer -- and his brother, the cellist Gautier Capuçon. Capuçon, who was born in 1976 in Chambéry, France, plays the 1737 "Panette" Guarneri del Gesù, which once belonged to Isaac Stern. He is married to the French journalist Laurence Ferrari, and they have a two-year-old son. Capuçon and I spoke over the phone on Monday about his journey on the violin, the benefits of playing chamber music, and the violin concertos of Brahms, Berg and Korngold. Laurie: What got you started, playing the violin? Renaud: As a young child, I was in an ear-training class -- there was a woman playing piano and we sang and did rhythms. This woman told my mother that I had a very good ear, and perhaps I should begin the violin. So that's how I began! Laurie: How old were you when you began? Renaud: I was four, and I began with a Vivaldi movement, which was kind of the Suzuki method. The great thing with this method was that you played straightaway with others. We had some individual lessons, but we also some lessons with other kids. Right away, I developed a love for playing together. I think I went on stage at four and a half, not playing more than four open strings, but at least doing a concert! Laurie: I understand you play on Isaac Stern's Guarneri del Gesù and also took a number of masterclasses with him. What was that like? Renaud: I had six or seven lessons with Isaac Stern in Verbier 1995, which was absolutely amazing. It has no relation with the fact that I play his violin -- it's just a nice story! The funny thing is, in 1995, I asked him to write me a recommendation letter because I was looking for a good violin -- of course, not a del Gesù at that time. I needed a recommendation letter for a sponsor. He wrote me an amazing letter, saying that I deserve to have an instrument. And just 10 years later, I was playing his violin! Of course, he had already died when I started playing his violin, so he couldn't know it. But I think life is nice sometimes this way! Laurie: What is that violin like? Renaud: It's a perfect violin. What I love about it is the way it speaks. I wouldn't say it's loud, or it's strong -- it's just large. I like its dark colors. Yet it can also be absolutely sparkling -- if you play Mozart, it's absolutely fine. I think it helps me a lot, because I'm perhaps lighter person, and the violin is more dark. It gives me a lot of different colors. Laurie: How long have you been playing it? Renaud: I've been playing it seven years. It's wonderful, it's really the violin of my life. I remember the first time I played it, I played the Brahms Concerto. I clearly had the feeling that the violin had sounded so many times with the Brahms Concerto, that the harmonies were already there. Of course, I mean this in a humble way. I play completely differently than Isaac Stern; I wouldn't ever compare myself. But the great thing with a violin is that, even if I were to buy it one day, it would never really be mine. After me, it will be played by somebody else. Laurie: It has its own life! Laurie: You mentioned the Brahms, and this is one of the concertos on your new recording. Tell me a little bit about your choice of using the cadenza by Fritz Kreisler for this recording of the Brahms. Laurie: There are a lot of cadenzas for the Brahms! Renaud: There are a lot! I didn't listen to all of of them. I love the Milstein one, but then I thought, it can't be played by anyone other than Milstein! (He laughs) You could say the same with Kreisler, but at least, I tried to do it. Laurie: In in the liner notes, you formally dedicate this recording to Christian Ferras. Renaud: His recording is my favorite recording of Brahms concerto, perhaps, ever. Of course, I love the one with Stern, and the one with Milstein, as well as some other recordings. But for me, as a French violinist, it was a great inspiration to be able to record this piece, 60 years later, with the same orchestra. When I stood up in front of the Vienna Philharmonic, I was thinking about him. I never met him -- he died before I was able to meet him -- but he always was one of the violinists I admired. I know his sonority. Even though we are completely different players, he's a great inspiration to me. So I wanted to dedicate the CD to him. Laurie: So when you were younger and first listening to this recording by Ferras, did you have a big vinyl record of his 1954 performance? Laurie: I wanted to ask you about the Berg Concerto. In the liner notes, you called it "the great concerto of the 20th century." What makes it so? Renaud: First of all, the structure and the way it's written is pure genius. You could ask any musicologist -- it's one of their favorite pieces, because they can explain every single beat, every single bar! It's everything: it's logical, it's clever, it's well-done. But it would be very boring if it were only a case for musicologists. The fact is, it's one of the most emotional pieces written for the violin. Of course, you have to know it very, very well to get from the structure to the emotion -- you have to get to know what's inside. People always talk about the three B's: Bach, Beethoven and Brahms. In my mind, I would love to make the fourth one, Berg. I really, really think the Berg Violin Concerto is a masterpiece. Laurie: A lot of those 12-tone works from the 20th century didn't go over so well. Renaud: I know. But this did! (He laughs) I guess because it's not just a musicologist's project. It's really done from the heart. You can feel that it's carried by this love of this daughter of Alma Mahler and Walter Gropius (Manon Gropius, who had died from polio at the young age of 18, and for whom the concerto was dedicated "to the memory of an angel.") You can feel that he's deeply concerned about this, and he puts all his heart into the composition of this piece. Laurie: Speaking of other 20th-century pieces, you're going to be in Los Angeles this weekend, performing the Violin Concerto by Erich Korngold with the Los Angeles Philharmonic. Renaud: I've loved that piece for a long time. I discovered the concerto with the CD of Gil Shaham, which came out in 1994, with the Korngold and the Barber. Laurie: That's when I discovered it, too! Renaud: I guess a lot of people discovered it at this time! Thanks to Gil, I learned it very quickly, and I've played it almost 10 years now. I love it. It's one of the concertos you can't be bored of playing. It sings all the time, and its proportions are very good: it's rather short but not too short. It's very well-written for the violin. We don't have so many concertos like this, from this period of time. Laurie: The Korngold is such a sunny piece, considering that it was written in 1945. The Shostakovich concerto was written just a few years later, and it's the opposite in disposition. Renaud: I know. But I wouldn't say the Korngold is a sunny piece exactly -- it's a sweet piece. It's a Viennese piece. We forget, especially in America, that Korngold was a Viennese composer, a guy who came from central Europe. We just think of him as a Hollywood composer, but he's not! He brought his music from Europe and adapted it to Hollywood, which is completely different. From the violin concerto, I discovered Korngold, and then I dug into all of his chamber music. I played his trio, I recorded his Violin Sonata last year, and I played his suite, I played his piano quintet, piano quartet -- I played almost all his chamber music. And it's interesting to play the Korngold Violin Concerto, also knowing his opera, Die tote Stadt, which is a masterpiece, and knowing his Symphony in F sharp major. It's great music; it's fantastic music. Laurie: I was reading your biography, and you've collaborated with a lot of musicians, including your brother, Gautier Capuçon. Did you start playing with your brother when you were a child? Renaud: No, because he is five years younger than me. When I left (to study at the Conservatoire National Supérieur de Musique de Paris at age 14), my brother was still at home. We began to play together when I was 19 or 20. It's great, of course. Laurie: How much chamber music do you do, versus solo playing? Renaud: I began to play chamber music when I was very young. Of course, these days I play a lot of solo concerti. As much as I love performing concerti, I couldn't do just concerti! I always try to balance it. I need chamber music; for me, it's like bread and water. When you are playing a trio or string quartet, you build the performance with a lot of rehearsals and share ideas. When you go on stage, you are sharing the spotlight with three or four other musicians. Also, playing chamber music nourishes your view on the concerti. You play concerti differently, and you play chamber music differently, if you do both. It's like reading books written by the same author: you like one book of Victor Hugo, then you want to read everything. It's exactly the same. October 26, 2012 at 01:57 AM · Very nice. I'm sorry to say that his name is new to me, while I've known of the pianist for some time. I really enjoyed the Ravel. I assume he was using the Panette del Gesu. We usually expect a lot of bottom from a del Gesu, but this has a lot of chewiness everywhere. Speaking of many extant cadenzas to the Brahms, I've composed my own as well! October 26, 2012 at 05:06 AM · Okay, Raphael, that makes 22 and counting! October 26, 2012 at 02:11 PM · Very nice interview. I saw the brothers perform last weekend with the CSO at symphony center, doing Brahms double concerto and an encore which consisted of a Handel arrangement. Outstanding performance, very entertaining, especially the Handel encore.